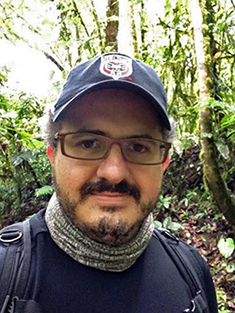 Research: Benavides’s research focuses on Nicaraguan migrant workers in the Sarapiquí region of Costa Rica and the dengue fever epidemic. His research combines theories and methods from the fields of medical anthropology and Science and Technology Studies (STS). Benavides is interested in understanding how migration, poverty, politics, health care policy, and social construction of illness become part of the dengue fever cycle. He is also interested in exploring how knowledge about disease transmission, risk, and prevention is co-produced by Costa Ricans, migrants, health care practitioners, and policy makers. 2012 Hollowed, M., J. Benavides, T. Hollowed. "Dietary differences of Ngöbe living within the Territorio Indígena Guaymi de Coto Brus, Costa Rica: An indicator for the development of chronic disease," Journal of Global Health Perspectives April 16. 2002 Ortiz, J., J. Benavides, A. Ramírez, J. Fornaguera. "Age-related differences on behavioral, neurochemical, and immunohistoligical parameters after two striatal 6-Ohda injections in rats: A model of Parkinson's Disease." Presented at the 11th Annual International Health and Medical Educational Consortium Conference, Havana. 2001 Benavides, J., G. Ivankovich, H. Raventos. "Obstetrical and neonatal complications and risk of schizophrenia." Presented at the 10th Annual International Health and Medical Education Consortium Conference, San Pedro Sula (Honduras).